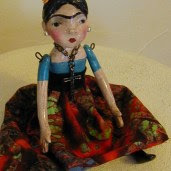 Here's another found object doll I listed today. Click here to see her on ebay. Good luck with her auction! Wishing you a happy July 4th weekend! Oh my she is Beautiful!! !